It’s Labor Day, so let us do the work for you! 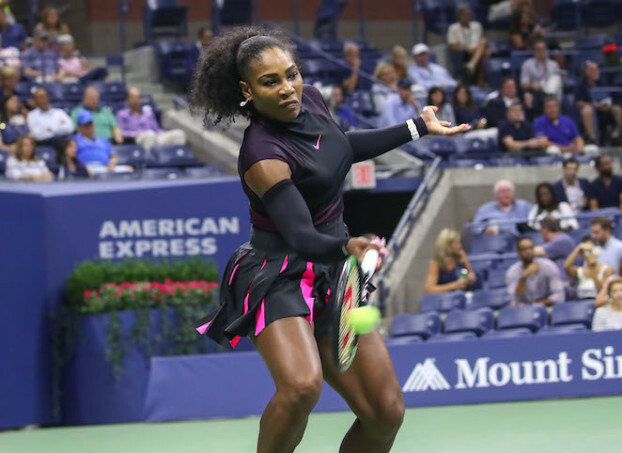 One of the most fun days on the tennis calendar is upon us: Labor Day at the US Open. 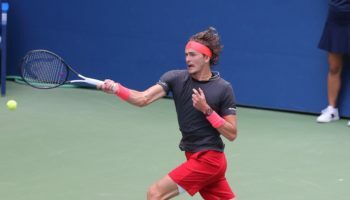 The past three days have seen attendance records being shattered at the Billie Jean King National Tennis Center, but, with most people having the day off from work and possibly making their way out to Queens on the “7” train or Long Island Railroad, it wouldn’t be a surprise if another attendance record is set today..
What also should be expected today is high-quality tennis, as Ashe Stadium is packed with Round of 16 matches that ooze with juiciness. 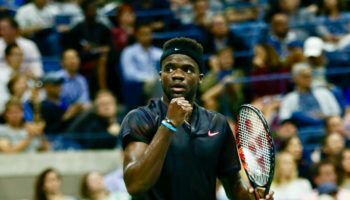 To start off on Ashe, one of the rising stars of the ATP Tour, No. 8 Dominic Thiem of Austria, takes on the 2009 US Open Champion, Juan Martin del Potro of Argentina. Can Delpo’s amazing summer continue with a return to the quarterfinals? Both Williams follow that match, with Venus Williams taking on the in-form Karolina Pliskova and Serena Williams taking on our crossword puzzle extraordinaire, Kazakhstan’s Yaroslava Shvedova. Just as much intrigue on the outer courts as well, specifically on Louis Armstrong Stadium. Simona Halep takes on Carla Suárez Navarro to start off, with Stan Wawrinka and Kei Nishikori also featuring on Armstrong. On the outer courts, amazing doubles action will take place. If you’ve seen Andy Murray enough times, you can see his brother, Davis Cup winner and Grand Slam champion Jamie Murray, pair with Bruno Soares to play on the new Grandstand later today. Also, Marc Lopez, who paired with Rafael Nadal to win the gold medal in men’s doubles in Rio, is playing with Feliciano Lopez in doubles in the third match on Court 17. It should be fun times indeed! So let’s get to work while you sick back and enjoy the tennis. As always, the most recent blog entries are on the top. 11:30 PM EST: Speaking of pictures, here are some pictures that we’ve promised. Didn’t make it out to Ashe for the night matches, especially since the Murray-Dimitrov match was a total rout, but it was great watching Ana Konjuh reach her first-ever quarterfinal in a Grand Slam just now in beating Aga Radwanska. Saw that on our monitors while Rob and I talked pics and I typed up a feature on Anastasija Sevastova for The News Hub. You should read it. 6:35 PM EST: Eventually, I signed it as well! 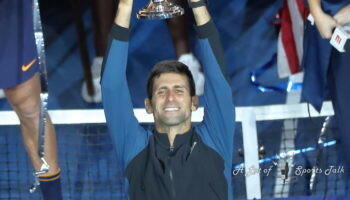 It was fun to do it as well as be a (very small) part of tennis history and magic! Maybe I’ll put up the picture. Maybe I won’t. Will have to skedaddle for a while, as I have to look over the pictures Rob took, as well as a couple of things to tie up outside of here. See you in an hour or so…and with pictures, too, I hope! 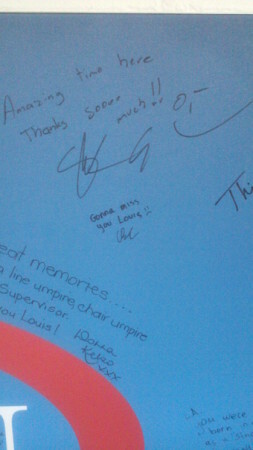 6:24 PM EST: As you might be able to see, there are signatures on Sharpie, and those are from all the current and former staff, as well as players and other significant figures here at the tennis center. One of the staffers, Bunny, came up to me and said I should sign. I passed, thinking it wasn’t my place to do so. 6:20 PM EST: What’s coming up is why I love being here! Rob and I went over to Armstrong, and I went with Rob on the pathway towards the photographer’s pit. While doing so, I came across a big canvas banner underneath the stadium, thanking Louis Armstrong Stadium for the near 40 years of memories. 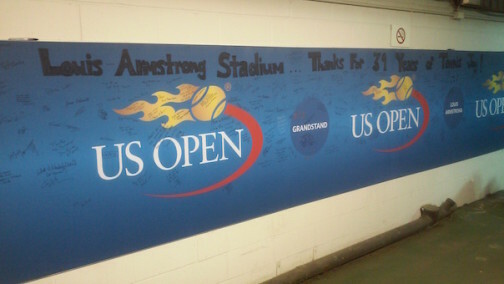 It’s in its last year in use for the US Open this year, and seeing this was definitely a nice touch! 5:06 PM EST: After a couple of days, we’ve finally gotten another interview! This time, it’s with the Spanish doubles team of Feliciano Lopez and Marc Lopez, the winners of the 2016 French Open doubles title over the Bryan Brothers. They will face the Bryans in the quarterfinals of the US Open after their win today. 4:43 PM EST: Here’s the life of a reporter; Had planned on going to the doubles matches on Grandstand and Court 5, but was sidetracked by the possibility of interviewing Marc Lopez, one half of the men’s doubles gold medalists in Rio (Rafael Nadal being the other half). By the time the interview was done, both of the matches ended. Rojer and Tecau lost! Mirza and Strycova did win their match. Pictures from those matches very soon! 3:55 PM EST: Stan Wawrinka just wrapped up his match against Illya Marchenko in four sets, so Armstrong will await Kei Nishikori-Ivo Karlovic. On Court 5, the No. 5-seeded men’s doubles team of Jean-Julien Rojer and Horia Tecau lost the first set and are up 3-2 in the second against Robert Lindstedt of Sweden and Aisam-Ul-Haq Qureshi of Pakistan. Probably going to head out there now. Also, new Grandstand has Sania Mirza and Barbora Strycova playing doubles. Might head there, too. 3:40 PM EST: Now it’s Game, Set, Match for Pliskova! A forehand goes long and Pliskova moves on to the quarterfinals! My word, what a match! Pliskova’s amazing form continues, and she’s on to the quarterfinals! 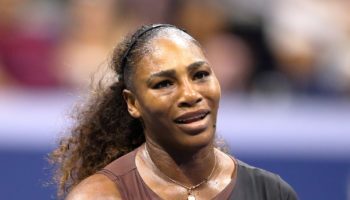 3:39 PM EST: Williams hits a backhand long and it’s over…NOPE!…Williams challenges, which she does so rarely, and Pliskova’s groundstroke preceding Williams’ errant backhand was indeed long. 6-3 Pliskova. 3:36 PM EST: At 3-2 to Pliskova, the Czech comes up with an amazing stab at net for a winner for 4-2. Two more points to the Czech later and it’s match point! 3:35 PM EST: VENUS SAVES THREE MATCH POINTS, WINS NEXT FIVE POINTS TO FORCE TIEBREAK! MORE CAPITAL LETTERS!! 3:28 PM EST: First two points to Pliskova, including an ace at 15-0. Now a forehand winner sets up triple match point for the Czech! 3:26 PM EST: Pliskova breaks! And she does it using the net cord, as a backhand return hits the tape and goes over Venus’s head at the net and lands in for a winner. Pliskova will serve for the match now at 6-5!! 3:24 PM EST: After a long rally, which included a line-clipper from Venus that might have been long, Venus comes up with a forehand winner to bring up deuce. Now an error brings up break point again for Pliskova! 3:23 PM EST: Venus wins first two points on her serve, then Pliskova wins next three, the third coming on a backhand error on a short ball at the net from Venus. It’s break point! 3:20 PM EST: Another forehand winner from Pliskova! Game Point! Then an unreturnable serve to tie it at 5-5! More pressure-packed tennis ahead! 3:20 PM EST: Venus with match point!! Pliskova then hits a swinging forehand volley winner to bring it to deuce! we fast forward to the point of the Pliskova-Williams match when we’re sitting in the media box when it’s 5-4 Williams in the final set! We ate in the media room and we saw Venus get down a break in the third, only to get it back to tie the match at 4-4. After a long service game with four deuces, Venus held for 5-4. Now it’s 30-30 on Pliskova’s serve. Venus is two points away from the quarters. 2:24 PM EST: One last stat before food: Pliskova has won 15 of the last 20 points in the match against Venus. Now 16 of the last 21 after she wins the first point of the eighth game. 2:22 PM EST: Pliskova now breaks Venus and the Czech is up 4-3 in the second set. Looks like intrigue building on Ashe. Maybe we head there! But, again, food first! 2:17 PM EST: We were thinking of heading out to Armstrong, but Stan Wawrinka has his match against Illya Marchenko of Ukraine in control, as he’s up two sets, 6-4, 6-1. The No. 1 doubles team of Pierre-Hugues Herbert and Nicolas Mahut is in a battle on the new Grandstand against Jeremy Chardy and Sam Groth. The Frenchmen are up 6-4, 5-7, 3-2 and have the break. Have to eat now, but maybe we make it there before the end?! 1:55 PM EST: With no pressure on her serve, Venus hits freely and is able to break Pliskova and take the set, 6-4. Heart-in-mouth moments at the end of that first set, but Venus pulls it out. 1:52 PM EST: Venus goes up 5-1, only to get broken twice, and we’re now back on serve at 5-4. See what happens when we turn our heads and assume a set is over? 1:24 PM EST: How good has Pliskova been this year? 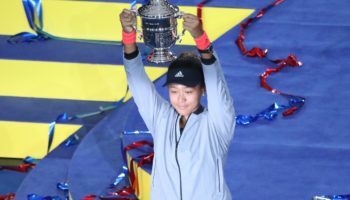 She just recently won the Cincinnati Masters 1000 series event last month, has also won in Nottingham, reached the final of Eastbourne leading up to Wimbledon and also reached the semifinals of Indian Wells. 1:23 PM EST: Pliskova is arguably the hottest player on the WTA Tour, yet Venus Williams couldn’t care less right now. Holds at 15 for a 3-0 lead. 1:20 PM EST: I can watch Venus Wiliams volley at the net all day and not get tired of it. Three consecutive volley winners (two forehand, one backhand drop shot) and she has break point on Pliskova’s serve. Two points later, Venus gets the break when a Pliskova backhand is netted. 2-0 Venus. 1:14 PM EST: Venus starts off the match with an ace. Not a bad start at all! She goes on to hold at 30, ending the service game with another ace. 1:00 PM EST: Back to the desk to start reporting, from the media room first then on Ashe. About to start watching No. 10 Karolina Pliskova vs. No. 6 Venus Williams. Should be fun! 12:55 PM EST: At the media help desk to take care of some things for Rob to get out onto Ashe Stadium. Speaking of Rob, his photos from yesterday will be up very shortly. Still working out the formatting on the page, but you’ll love the action shots! 12:45 PM EST: So I’m getting ready to walk into the media room and am assuming I’m not going to run into any traffic on the main concourse. Wrong! 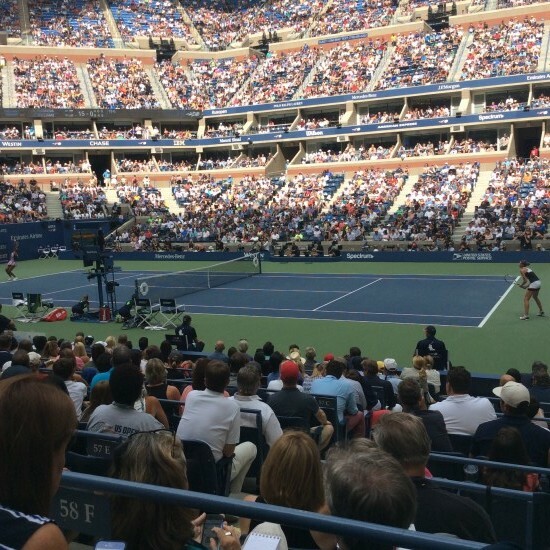 Fans stream out of Ashe, and I’m wondering if the Dominic Thiem/Juan Martin del Potro match ended that quickly! It did! Thiem retired in the second set, and del Potro’s summer of fun continues as he’s on to the quarterfinals!